Aimed at small workgroups and small businesses, the Oki MC860cdtn strives to be a budget-friendly solution that combines a copier, scanner, fax machine, and a colour printer in one powerful device. Users are promised speed, efficiency, and high productivity with the Oki MC860cdtn multifunction printer, but it is oversized, heavy, and quite expensive for the typical small office budget. The Oki MC860cdtn is a tall multifunction machine with an understated appearance at first glance. Its centrepiece is the 5.4-inch touch-screen in the well-organised control panel with dedicated buttons for one-touch operations. 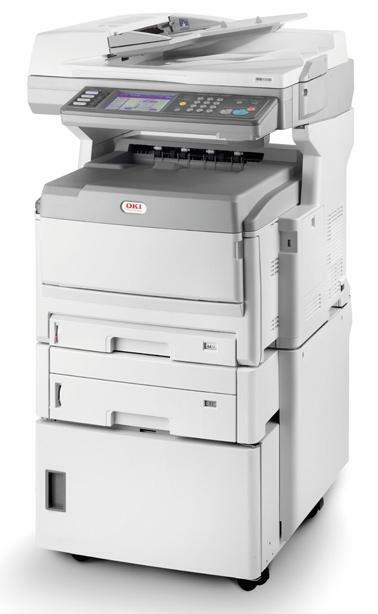 The Oki MC-860cdtn A3 colour laser printer runs on 512MB of RAM and integrated with a 40GB hard disk drive. The Oki MC860cdtn LED printer is Ethernet-ready and integrated with a 33.6Kbps super G3 fax modem. This multifunction device is reasonably fast, at up to 26ppm in colour and 34ppm in monochrome. The Oki MC860cdtn laser printer is easy to operate with one-touch keys for faxing, scanning, copying, and printing. The large touch-screen display is another bonus for a user-friendly interface. A small workgroup can share the Oki MC860cdtn colour multifunction printer via a network connection, and they can save resources with the automatic duplexer on-board. A 3-year warranty is available too. The Oki MC860cdtn is an expensive multifunction printer for the small office, and those with limited budget could settle for a smaller and cheaper but equally efficient all-in-one device from another brand. The device is potentially expensive to operate because of toner costs. The Oki MC860cdtn printer doesn't offer built-in Wi-Fi options and the copier's resolution is only limited to 600dpi.